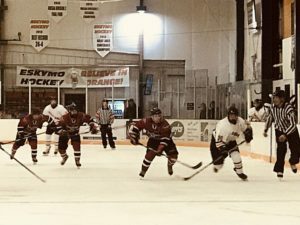 Marquette, MI – November 27, 2018 – The Marquette Redmen Varsity Hockey team was on the road against the Escanaba Eskymos tonight on Fox Sports Marquette 105.1-99.9. 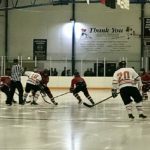 The bout against the Eskymos tested Marquette as they were coming off of a tough loss against Houghton before the Thanksgiving weekend. The start of the first period was pretty even keel as the Redmen and Eskymos tested the waters. 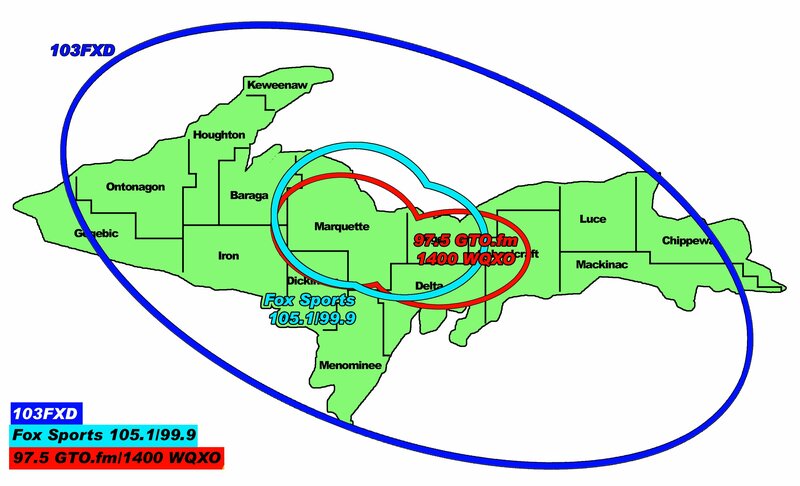 But Marquette was the first to strike. 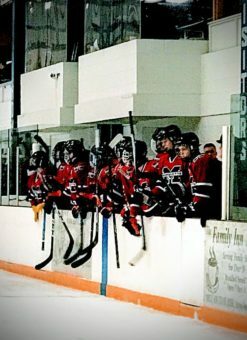 Redmen forward Gaetanno Cammarata scored for a 1-0 lead over Escanaba. Just 14 seconds later, another Redmen forward, Nick Leafers, got a shot off that found the back of the net for a 2-0 lead over the Eskymos. 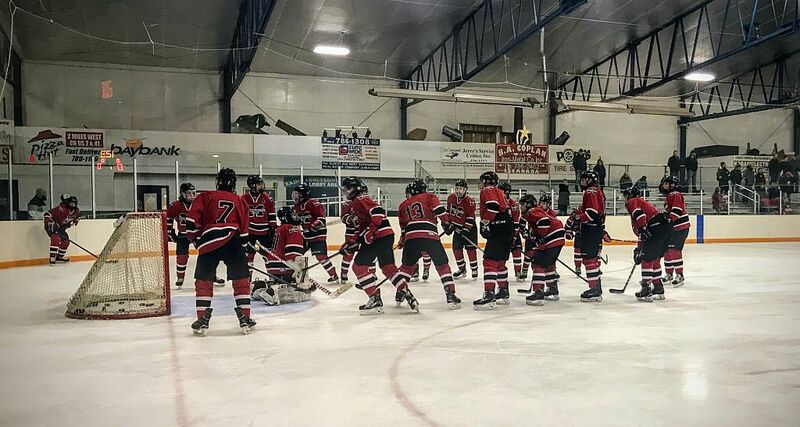 The Marquette Redmen Hockey team was on the road against the Escanaba Eskymos. 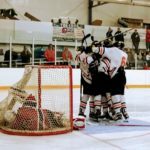 The Eskymos couldn’t end on a zero, however, so Kyle Krutina of Escanaba scored as the final minutes of the the first period ticked down. The Redmen still led the Eskymos 2-1 at the buzzer. 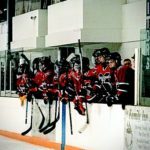 After 19 shots on goal to Escanaba’s 9 in the first, the Redmen continued on their mission when they took to the ice in the second period. Redmen defenseman Thomas Dunleavy scored with help from Ryan Baldwin and Tanner Phillips to bring the score to 3-1. There was no change to the score as the second period came to a close. 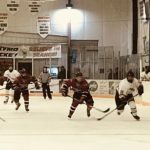 The Redmen looked strong, however, and protected their lead going into the final period of the game. 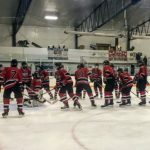 The Redmen took on the Eskymos in the fourth game of the season. 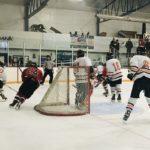 Escanaba wasted no time at the start of the third period. Eskymo forward Grant Wickham found the back of the net to tighten the gap to 3-2, with Marquette still in the lead. Marquette’s Sean O’Connor answered the Eskymo goal with one of his own to bring the score to 4-2. Then Gaetanno Cammarata decided the Redmen needed a little more insurance. For the second time tonight, Cammarata fired off a shot that found the back of the net. Marquette’s lead widened to 5-2 over Escanaba with less than two minutes in the game. There were no surprises in the final seconds of the game, and the Redmen claimed the win over the Eskymos. The final score was 5-2. 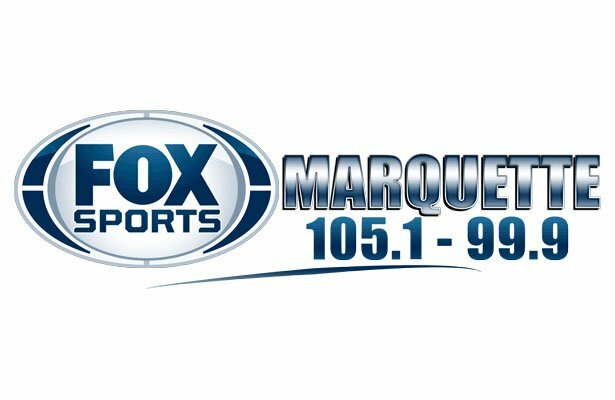 The Marquette Redmen Varsity Hockey team will be at home against Calumet on Tuesday, December 4th on Fox Sports Marquette 103 FXD. Tune in for the pregame at 6:30 pm. The puck drops at 7:00 pm. Photos courtesy of Amy Luke. 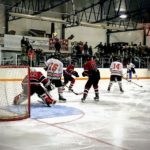 Some action behind the Eskymo goal for the Redmen. The Eskymos celebrate a goal. 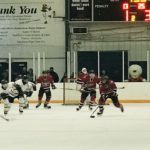 The Redmen were on the road against the Escanaba Eskymos. 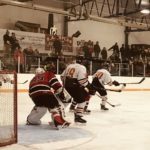 The Marquette Redmen took on the Escanaba Eskymos. Some Redmen action at the goal. The Marquette Redmen face-off against the Escanaba Eskymos. 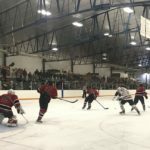 Redmen goalie Brennan Hakkola protects the goal. The Redmen cheer on their teammates.